TheGunBlog.ca — Bill C-71, the Canadian government’s planned law against hunters, farmers and sport shooters, turns one today. Here is a brief timeline of key dates with highlights of our coverage over the past year. We wish Bill C-71 a lousy birthday and a quick demise. The Ministry of Public Safety hosts a national Summit on Gun and Gang Violence to set up the messaging and storyline for Bill C-71. We predicted two of the main themes would be “rising gun crime” and rising “domestically sourced crime guns.” Turns out we hit a bullseye. One of the authors of the analysis was David Rodier. 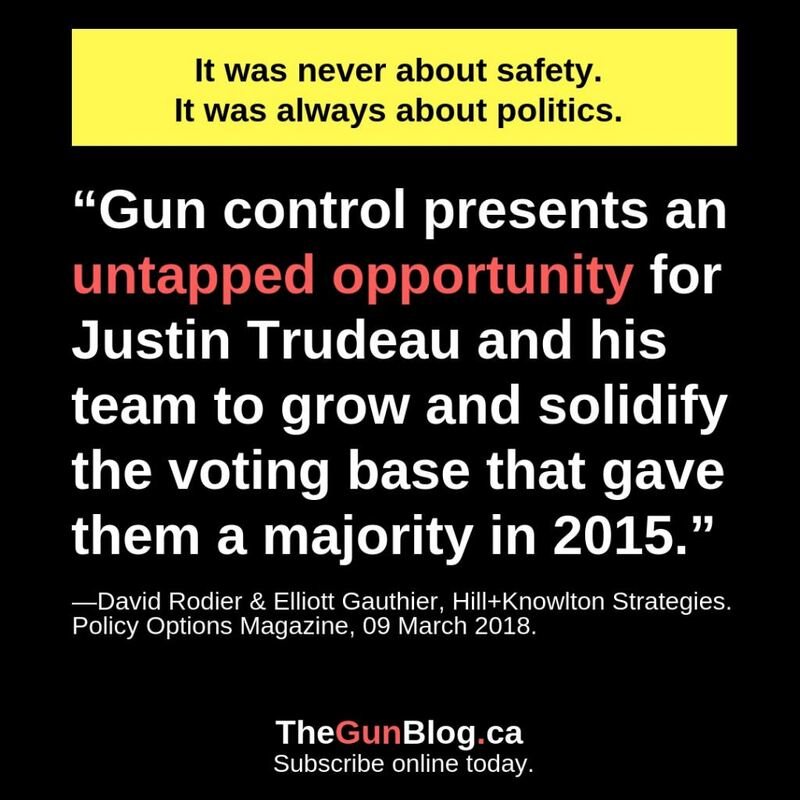 He helped Liberal Minister of Justice Allan Rock in the 1990s to pass the Firearms Act, and later worked as a registered lobbyist for the Coalition for Gun Control. TheGunBlog.ca led coverage of Bill C-71 from the day Minister of Public Safety Ralph Goodale presented it in the House of Commons. Exclusive interviews with industry insiders and other experts help us to explain the bill and show its political and practical significance for millions of Canadian men and women. 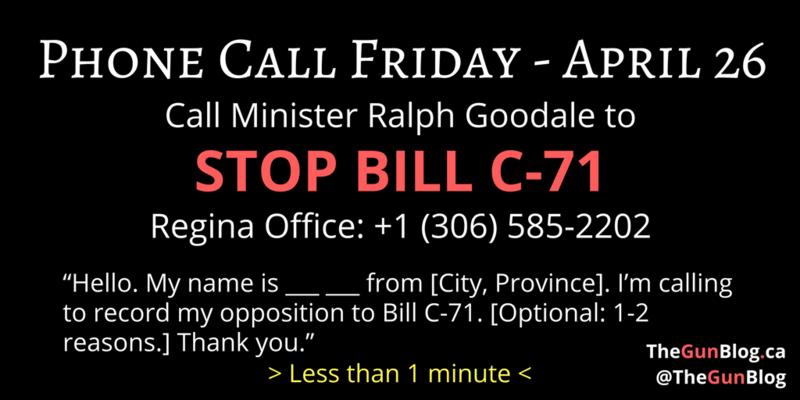 The government distorts, misinforms and misleads politicians, the press and the public to promote Bill C-71. The RCMP corrected a web page on licensing after TheGunBlog.ca reported an error. TheGunBlog.ca stepped up its support of grassroots political action to oppose Bill C-71 following an interview with MP Bob Zimmer and other key Members of Parliament. Our first “postcard” for what became known as “Phone Call Friday” was shared and viewed tens (maybe hundreds?) of thousands of times on Facebook, Twitter, Gun Owners of Canada, Canadian Gun Nutz, Reddit, and elsewhere. See more postcards for sharing. The RCMP said it reviewed its web pages on Bill C-71 after this article, which triggered a series of events that are still unfolding. See below. The Bill C-71 Book is released, marking the first time in Canadian history a book analyzing draft gun legislation is published before the law takes effect. It includes plain-language explanations of the legal framework for gun ownership, with a special chapter on how RCMP acts as a law-maker and law-enforcer on gun classifications. The book is downloaded and distributed at the Ministry of Public Safety within hours. The Canadian Shooting Sports Association, which co-produced The Bill C-71 Book, distributes copies to Members of Parliament and Senators. 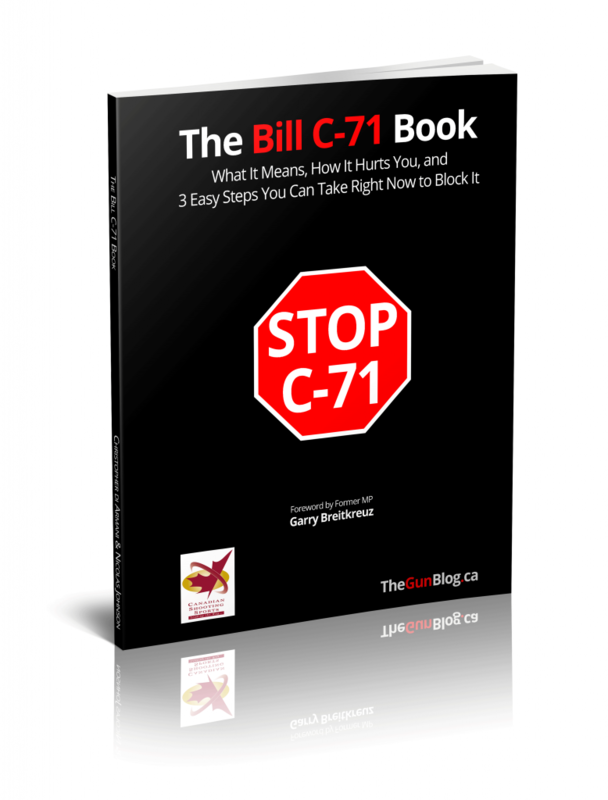 They reference, mention and quote the “Stop C-71 Book” in the House of Commons and the Senate. 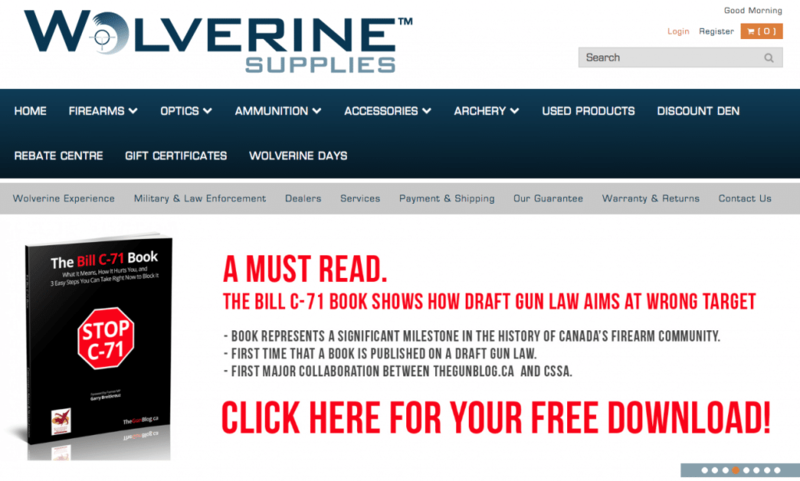 Screenshot of Wolverine Supplies homepage following the release of The Bill C-71 Book. The RCMP overhauls its Bill C-71 pages following our reporting. Glen Motz, a Conservative Member of Parliament, stands in the House of Commons to ask whether the RCMP violated principles of parliamentary supremacy in relation to law. The Speaker of the House supports Motz that the RCMP appears to have undermined the authority of parliament. He asks a House of Commons committee to investigate. The Conservative Party of Canada, the only federal party to consistently oppose unwarranted restrictions and prohibitions on legitimate hunters, farmers and sport shooters, makes one of its first campaign promises the repeal of Bill C-71. TheGunBlog.ca is the first media to give the breakdown of the vote in the House of Commons and report that Maxime Bernier, who had recently quit the Conservative Party to create his own political group, was absent for the vote. We publish his response. The House of Commons Standing Committee on Procedure and House Affairs begins its investigation whether the RCMP acted in “contempt of parliament” on Bill C-71. The review is still underway. He shows the falsehood behind its claim of responding to “rising crime” with firearms. The Liberal Party pitched many of its elements to get elected in 2015, when such crime was at a historic low. He said last month the Conservatives will “do everything short of gutting” the bill. Supporters of Bill C-71 have little concern for the more than 10,000 men, women and businesses who will have their firearms prohibited and eventually confiscated under of the bill. 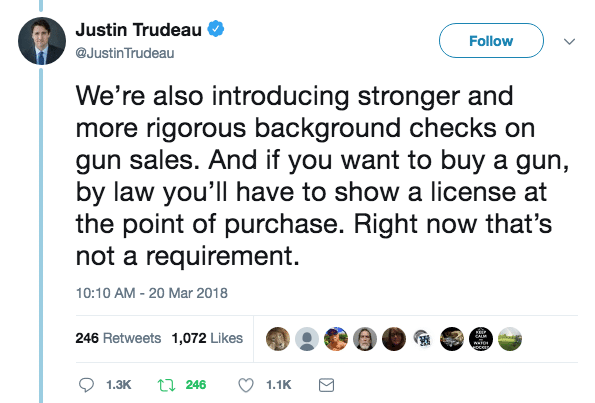 It gives the RCMP the ability to easily prohibit and confiscate any firearm in the future. Bill C-71 will have political effects beyond its practical consequences for millions of Canadian men and women, from casual plinkers to world-class hunters and competitors. Almost nobody mentions that Bill C-71 will violate personal privacy by requiring the federal police to build a “connections registry” of gun owners. The Senate committee reviewing Bill C-71 expects to finish its work in early to mid-April. The bill will almost certainly become law before the general election in October. It has helped make gun ownership a critical election issue for firearm users. Shooters can continue to contact politicians and media to share concerns, and invite them to the range so they experience the reality of the shooting community. See detailed timeline on our Bill C-71 page. Our patrons and donors, subscribers and readers who share, forward, repost, recommend and act on our work. See dozens of reader comments. The Canadian Shooting Sports Association, National Firearms Association and Canadian Coalition for Firearm Rights for sharing our reports with their members. The experts, advisors, insiders and researchers who help us behind the scenes. Hundreds of thousands of individuals, associations, businesses, gun clubs, shooting ranges and others who actively oppose Bill C-71. Our united effort has turned Bill C-71 into one of the government’s highest-profile and most-controversial legislative proposals, with some of the highest levels of grassroots opposition. The bill may yet be defeated. Subscribe to our e-mail updates to get info, intel and insight that aren’t on the website. It’s still free.